Since we do this three times a day every damn day, it’s lost its pathos, but I let them out and they race back to the house, free at last. Except today Milton was busy with a piece of cardboard he’d found, so I let the girls out, closed the gate, and went back in the house to make sure the girls had gotten in okay. 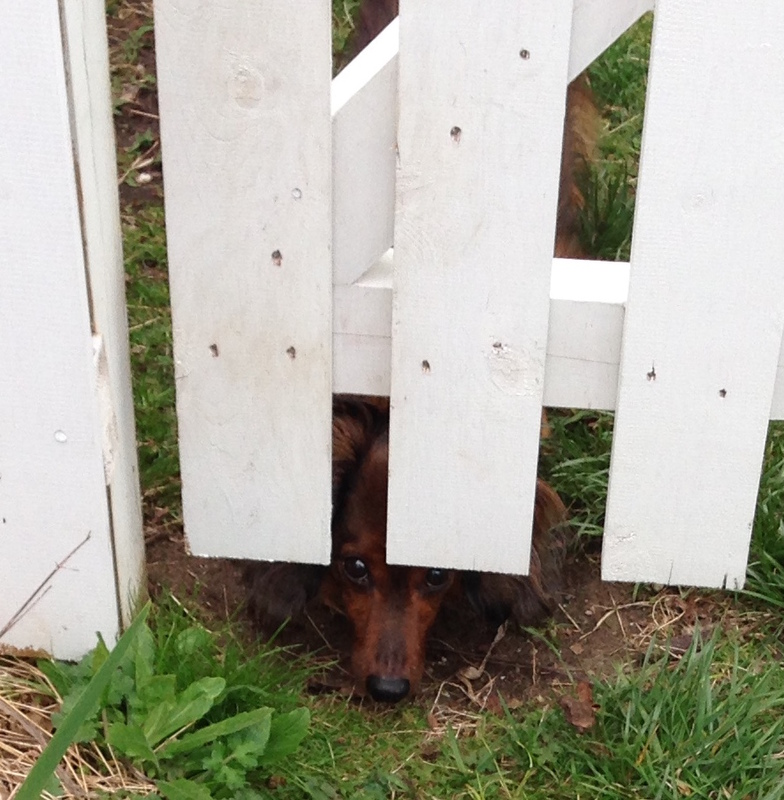 There’s a reason my across-the-street neighbor calls Milton “Houdini.” Now I have to put a rock there to slow him down. 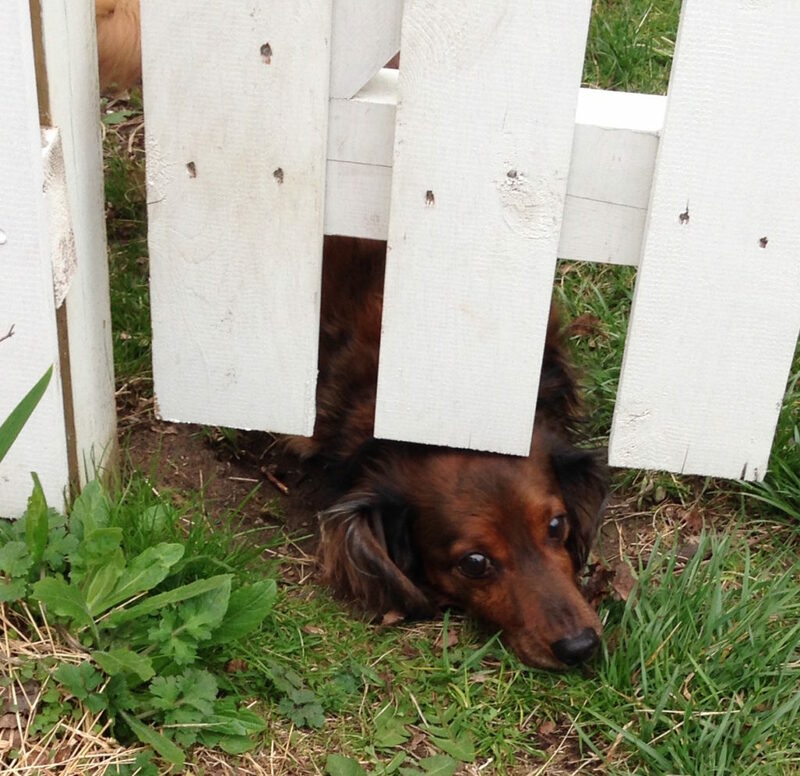 OTOH, he’s really cute, even with his head stuck in a picket fence. This has been your Moment of Dog. I must say, he looks completely irrisistible in the last one. He’ll be through to Australia next. Well, he is a dachshund. It’s what they do. Look adorable and dig holes through anything that comes between them and their person. Look adorable and dig through anything that comes between them and what they want. 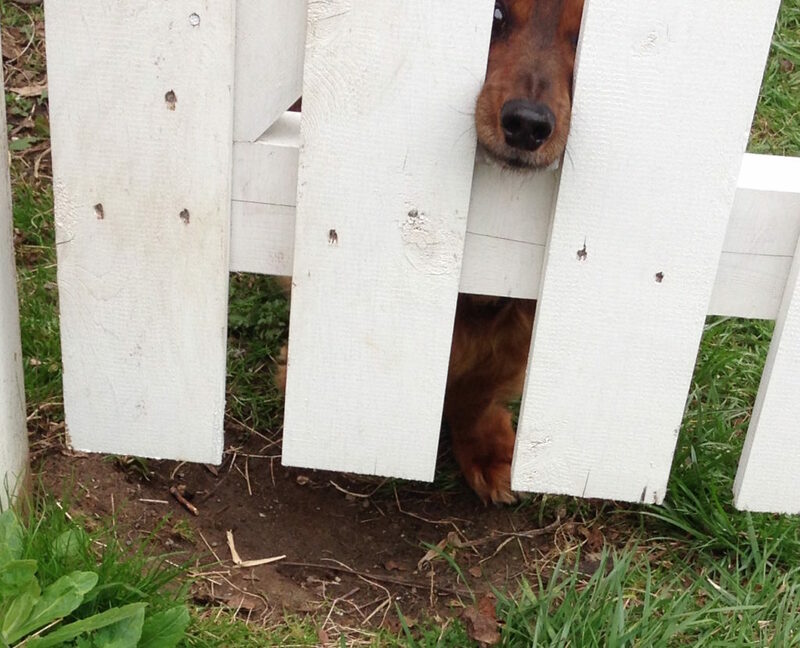 Did he dig that hole in the ten minutes you were gone ?! I think he’d been working on it before and I’d just missed it. Veronica is as glamorous as ever! Just didn’t want her to be ignored in the Milton love. And Mona is still basically a Muppet in dog form. We had therapy dogs here today. Next week is finals week. 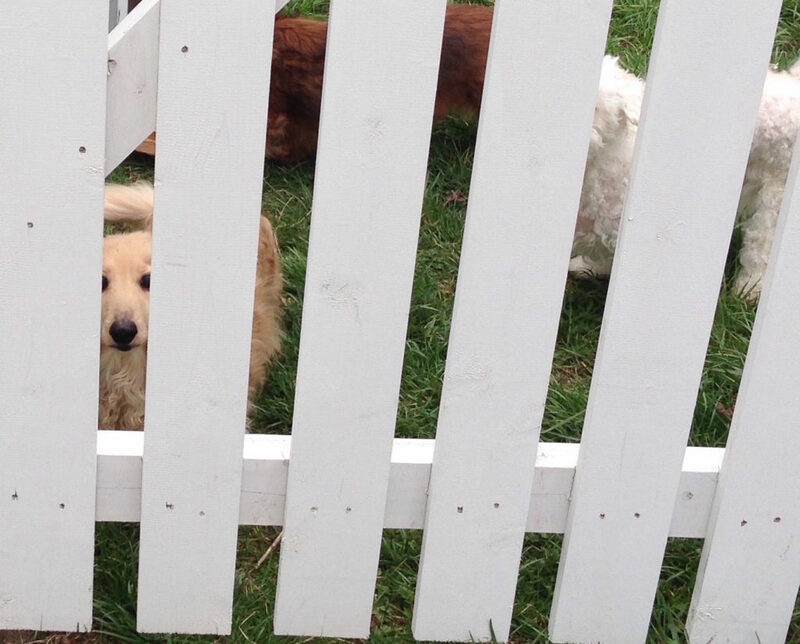 We say we bring the dogs in to help the students’ stress levels but they aren’t the only ones stressed around now. Like small, furry prisoners. I retired from my job (my old job–my new job is as a full-time writer) yesterday and Abigail seems to believe the treat faucet is permanently in the “on” position. Also, walks. Lots of walks. How do you get anything done? You establish a pattern and tney get used to it. God help you if you oversleep. Aw, just gawrsh. 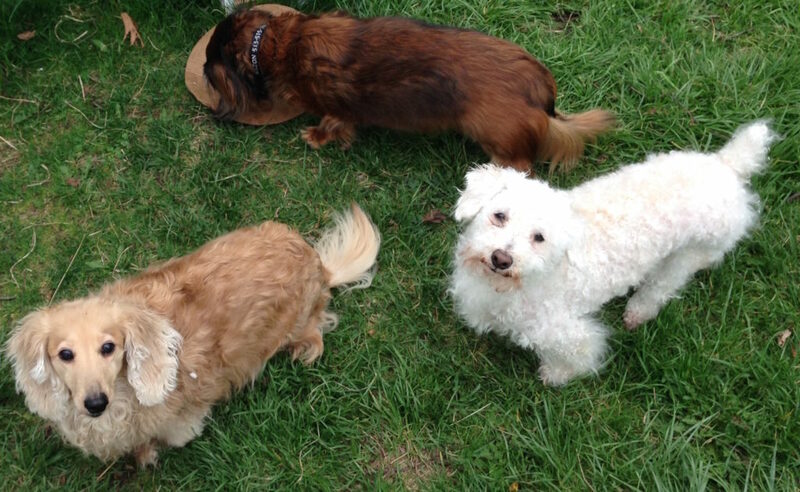 Milton, Mona and Veronica, dog lovability. I’m overcome. I just have to say I stumbled upon your blog today and I wish I had known about it long before now. I just purchased my last three of your books to complete my collection and I can’t wait to read them all again and again. You truly are my favorite author. So many times I will laugh and have to explain to my husband what is so funny while I am reading. 🙂 Thank you for such wonderful books! Oh, thank you! And welcome to Argh! I live for Moments of Dog. Me, too, actually. Often they’re the highpoint of my day. LOL, I’ve missed your dog posts! Good to see them having a very doggy spring. We got two puppies in December, and old lady Colleen has managed to adapt, although there is still some growling when the puppies get too exuberant. They’ve started living in their dog houses this week, with the warm weather. I don’t know how long it will last — they chew on their house. My husband finally “remodeled” them and reinforced the entrances, but I don’t know. Also, in other news, he spray-painted their houses with their names, and apparently he thinks that Colleen’s name is Karen. Does it matter? It’s pretty much the same diff in Japanese. I’ve just never, ever, ever seen her as a Karen. I don’t even know if I should bring it up. But when I text him about the dogs, he must be wondering, “Who the hell is Colleen?” Well, in Japanese of course. Same diff. Ah! Finally figured it out. The Pokey Little Puppy! That’s what Milton looks like he’s auditioning for. One of my favorite Little Golden Books! I love the dog posts. Nobody can work the Big Sad Eyes like a dog. There’s a Jack Russell in our neighborhood that I call Houdini. And another one that I call Tigger. His family has an eight foot fence, but I often see Tigger bouncing in the air to look over it. You should ask my daughter. She’s a postie on a little bike in Sydney Australia. she could write a book about it… she should, come to think of it. But the ending is okay. There was lots of sand on the other side. But the moral of the story is: Look before you Leap. Never was a truer word spuk. I once had a wolfhound mix who when she saw the ocean for the first time went barrelling in. The wave hit her as she hit the water and she went under. She wouldn’t go near the water forever. She kept looking at me and shaking her head like- you tried to kill me, I’m not falling for that again.